Sunny day dam break with the starting water surface elevation at the normal water surface elevation of the impounding structure. Dam failure during the required spillway design flood. An overtopping failure is modeled if the emergency spillway is unable to pass the spillway design flood without overtopping the crest of the dam. A piping failure is modeled if the emergency spillway has enough capacity to pass the required spillway design flood without overtopping the crest of the dam. Routing the spillway design flood through the dam without any failure. 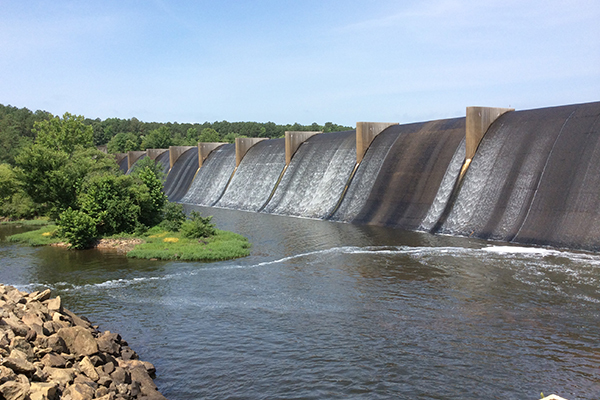 We use the HEC-RAS software to develop inundation limits for each of these scenarios to determine the greatest impact to structures located downstream of the dam. Based on the results of the model analysis, we develop a Hazard Classification for the dam, establish its required Spillway Design Flood (SDF), and perform an Incremental Damage Analysis (IDA) in accordance with the Dam Safety Regulations. This information is compiled into an Inundation Report summarizing our findings and subsequently submitted to DCR to demonstrate regulatory compliance on the part of the Owner.